There’s a difference between buying off-the-rack and having something custom-tailored. Whether it’s a business suit or a dress, you might luck out and get the right fit from the store, but a bespoke suit will fit you in a way that something store-bought won’t always. Believe it or not, the same applies to shelving. You may do just fine buying shelves and racks from a major shelving manufacturer, but in irregular spaces or custom use cases, a custom retail display from Shelving Design Systems is the perfect thing to pull your layout together. If you want to understand the “why” of custom shelving, it helps to understand the benefits you get from custom work generally and from Shelving Design Systems in particular. Custom retail shelving can be a great way to control costs. That’s because we take your budget and requirements into consideration when we design, and we endeavor to deliver a custom design that helps to pay for itself. Mass-produced shelving is cost effective because your options — colors, shapes, sizes, and materials — are limited. When it comes to custom shelving, the considerations of scale are different; the only scale we’re worried about is how the shelving we deliver scales to your needs. The rest is wide open, giving you options you probably didn’t realize you had, or needed. Our retail shelving is built to last for the long haul; we select and source based on quality and durability. But the same considerations go into our custom work, because we know you’ll settle for nothing less from our custom retail displays. One last consideration: your store or boutique’s layout and merchandising are, in some ways, similar to a home’s interior design. You may find that a statement piece can really set off the look of your space, or showcase unique merchandise, in a way even the best commercial shelving products couldn’t manage. 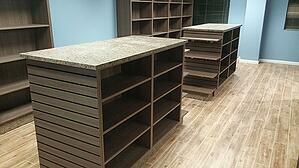 Shelving Design Systems handles custom shelving design and woodworking in-house. That gives us a higher degree of control over every step in the process, and helps to ensure we deliver a quality product every time. Your choices of materials and colors are as varied as the uses to which you can put your finished shelving. A quick thought in closing: while we take pride in our custom shelving solutions, we recognize that they’re something best saved for a specific purpose. 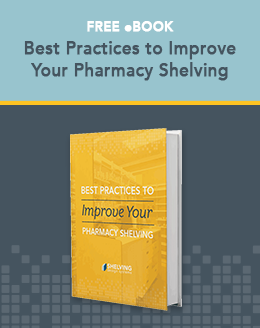 There are plenty of sturdy and well-designed manufactured shelves that will form the backbone of your retail or pharmacy layout with a great ROI (and, at times, without the need for custom work). We should know; we’re proud to feature Madix shelving, which covers a vast array of uses. Not sure if you need custom retail displays? Contact Shelving Design Systems. We’ll evaluate your space, your traffic, and your workflow as part of a shelving design consultation and undertake a shelving design that’s unique to your needs.